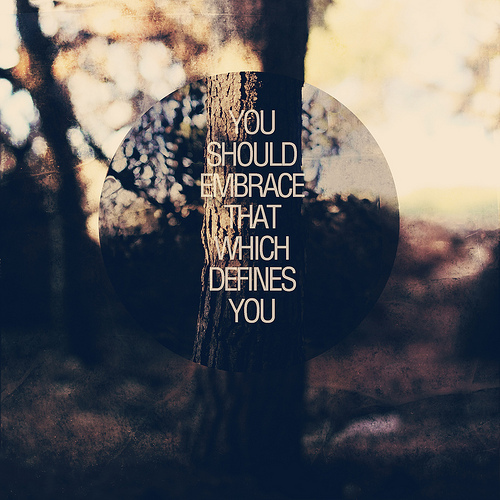 What defines you? Who are you? It hit me tonight…I have closed myself off from so many (men) because I don’t want someone strictly to fit my need of comfort. I want someone that wants to fight the battle with me. I want someone that has the same passion in their heart that I do. I want someone that believes in making a better life for perfect strangers of the world because he knows that is the right thing to do. I want someone that longs to know more and wants to learn more with me. There is nothing simple about the way my mind works so I can’t settle for a simple-minded person. My words are not meant to insult…I just have too much passion to talk about what is only on the surface. I have a need to always dig deeper and I want to meet someone that has that same need. I do want the surface things: companionship, laughter, comfort but I need the depth. I can’t lie about that….I have to say it and I do expect some people to tell me to lighten up. I won’t lighten up and I won’t change who I am….I am not desperate to have a life that is less than what I want. I want to use my words to help change the world. I want to step outside of my comfort zone and make my voice heard and do for others in any way I can. I want to meet someone with the same kind of passion that runs through their veins day in and day out. It may be a pipe dream but it is my dream. My dent in the world may be a small one but it will be mine and it will show how hard I worked in this life. I am beautiful and charismatic and charming and sensitive and inquisitive and curious…this is only but a short list of the amazing qualities that are a part of me. The right person won’t need to learn that as time passes but will be able to truly feel it the more time that is spent together. Life is not about our thoughts, it is about our feelings. I have been on dating sites for quite some time now but the funny thing is I have not been on a date in almost a year. I have not even really put myself out there. I had a guy email me tonight and write: For how long you have been on here you must be really picky. I wrote him back and said, “Is that a bad thing?” He told me that after this much time it must be. I contemplated it and I was not able to give into his thoughts. I am picky because I watch people….I watch people in chaotic relationships and I watch people strive to find a love that is not there. I will never settle for less of a love than I believe in….even if that means never finding it. Some people may find it sad that I think and feel that way but it gives me great comfort. For the first time I truly know what I want and I surely know what I don’t want. I don’t want to give into weakness anymore and settle for average when I know I am capable of obtaining extraordinary. I don’t want to just coast by in this life and settle….my heart does not work that way. I feel truly lucky for the life that I have. There are women around the world that are born into areas in which they are degraded from the moment they are born strictly based on their gender. There are women that are not allowed the gift of education or even the biggest gift of all…FREEDOM!!! I don’t want to take the beautiful life I have for granted and waste time on momentary pleasure or searching for someone to complete me. I complete me. If I meet someone wonderful they will compliment my life but not complete it. I want fulfillment in everything I do as much as possible. Love and passion seeps from every inch of my body and I want to share that with someone that will let me know (without words being needed) how much they appreciate it. From this day on I will never accept being treated like lesser of a person by anyone…that is my choice. I want to encourage women all over the world to find their voice. I do not want to go on feminist rants and talk about how women are suffering and blah blah blah. I, being a woman, just want to tell women that they are beautiful. I want to help women find their gifts and their passions. I want to share my thoughts and feelings with women I come in contact with everyday…even strangers, in hopes that they will share their lives with me. I can’t define who I am if I don’t know who others are. group. Can you even imagine how that made me feel? Through my personal struggles and continual journey throughout this life, she felt inspired. I want to inspire people throughout my life and I want to inspire them in ways that allow them to see their strengths and their beauty and their gifts that they are all so lucky to have. It is a cycle that not only allows them to grow but also allows me to grow. I become stronger the more I continue to see and believe in my own capabilities…knowing that I can help others that need to be helped. I am my dreams and my wants and my needs. I dream of spreading words of encouragement to anyone willing to listen and influence the lives of people (especially young girls and women) in a way that will make them truly believe in and see their beauty…their gifts…..the importance of their life. Everyone is important and so many people in the world do not know that or believe that because they have been kicked down and have been neglected and have been told differently. The thought that keeps screaming in my head over and over again is: What if it was me? What if it was my child (if I was a mother)? We all deserve freedom and we all deserve happiness. I cannot imagine never knowing happiness or living a life that did not include support of friends and family. I want to be a mentor and share with people the fact that I know that love and happiness is universal and it is something that all people deserve to experience….even those that think they are unworthy. We are not what we learn throughout life….we just believe those things. We are what we feel and I undoubtedly believe that every soul on this planet wants love and acceptance and support. Hatred and violence are learned and are unnatural (at least this is what I choose to believe). So, if you ask me again who I am, I would say that I am a believer in humanity….I believe all people have the potential for good if they are provided the right tools. Well said – thank you for writing and sharing. Perhaps one day I can recite a couple of poems that I wrote (in Punjabi – else I would have already shared them) – many shared ‘tangents’. I love this pic here. Is it your creation? there are only two things in your life over which you have complete control: 1. your friends, 2. your “partner.” you cannot control anything else, so make the most over what little control you have. you can’t control your job because you’re at the mercy of location and being selected. you can’t control your food because that’s dictated by how much you can spend. There is nothing wrong with being picky. I used to have a couple of profiles on dating sites but gave up because having blonde hair, to many of the male members, meant an easy lay who wouldn’t want commitment afterwards. On the other hand, I set up a profile for a brunette friend of mine, and she is now married to the second man who contacted her! Being picky means that you respect yourself. That’s never a bad thing.